Where Did I Meet Hundreds of Time Travelers? At the event itself I felt like I was beamed into the future, future which I was envisioning for Slovakia through NGLS project and for the whole world for last two years…Room packed with hundreds of social entrepreneurs, change makers with tremendous desire, drive and love for making our world a better place. They all have seen the future in their minds and driven by their internal calling, they were making it happen. Despite all nay-sayers, despite lack of resources, support of the community, they marched on to the future they have already experienced and envisioned. Atmosphere and energy in the room was beyond the pale…Those people were true time travelers! How Can We Recognize a Time Traveler? Time traveler according to my just invented definition -> is a passionate linchpin (= indispensable artist) slash bold inspiring doer slash courageous person with loving heart slash persistent believer in a better future slash initiative taker slash risking her all for the sake of showing other scared fellows that her envisioned future can become reality. After the panel discussion I walked up to the Jacqueline’s seat, where she was already surrounded by a crowd of well-wishers or advice askers. Till the last moment I did not have a clue what I wanted to tell her -> except thank you for all the work she is doing. So, I said so…and then I told her, that I loved her video made by our mutual friend -> she asked which friend? I said: Seth Godin -> connection was made. 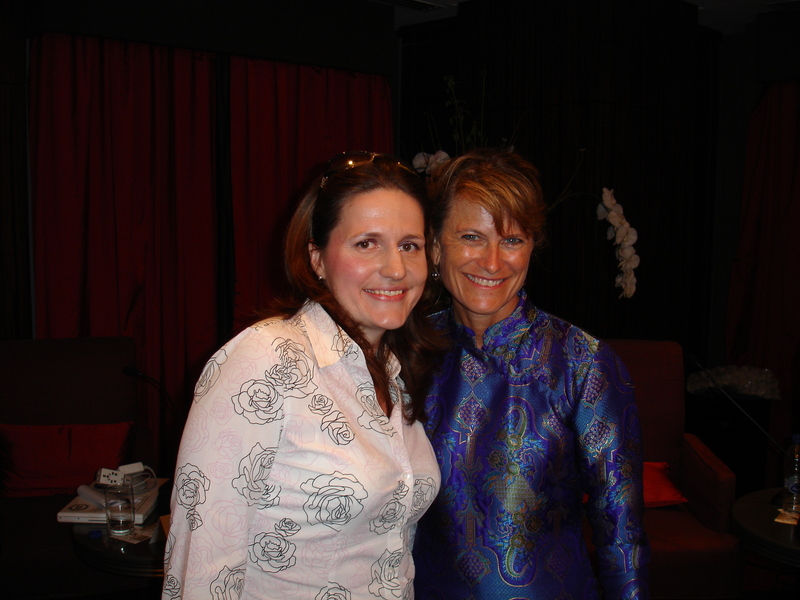 You cannot see it on the picture, but I was totally shaking when I talked to Jacqueline…Oh, my what an experience…When I was sitting in a taxi on my way home, I had wet eyes from gratitude…and I still have them now, while writing this post. do you know any time travelers? Do you have your own experiences with traveling in time? What proofs of interconnectedness have you encountered with? Share your stories and profiles of time travelers you know with us! P.P.S. : If you are hungry for more pics, you can see rest of the shots from conversation with this mind-blowing lady on my Flick stream. From here, I can tell you, makes total sense seeing you connecting with her.